There is a busy street in our town, not that the traffic passes quickly on it, but it’s a well-traveled street that is part of a route to two schools, along with leading to the main drag that runs through our city. A large storm drain runs under one section of the street. It definitely comes in handy during the spring, summer, fall or winter rains here in Texas. And, there is a duck family who loves to go from one side to the other. Most of the time they travel along the concrete drain under the bridge that crosses above it. But other times, the mama duck will zigzag across the street to get to the other side. Last spring, this caused a problem for drivers and probably a bit of concern for her. 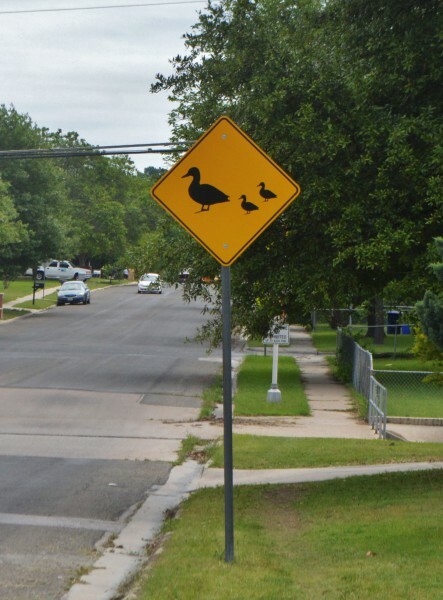 Drivers would brake and wait for her to get her little band of fluffy ducklings safely across. One concerned driver posted on the city’s Facebook page and asked if a warning sign could be put up so drivers could beware. It took about two weeks, but two signs went up and everyone breathed a sigh of relief. But mama duck, even with the signs put up by the humans, still has to get her ducks in a row and following along with her. Our lives are like that – all these little things we try to wrangle into place so we can keep right on going to where we need to be. How do we keep our ducks in a row? I keep lists, especially if I have a big day. My phone has a chime that alerts me to events where I, a news editor, need to be (today had four chimes—whew!). I have a lot of ducklings to wrangle! Sometimes, as soon as I feel the little darlings are all lined up, another one pops up and tries to make a break for it. One more duck to get in the row. Years ago, the Daytimer was all the rage, fancy leather binders with sections for everything from Christmas card lists to a place to tuck your bank statement. I owned one, and it worked for me during the time I used it. Now, all kinds of journals and calendars, electronic and otherwise, are available for us to use. I’ve seen the Passion Planner, which isn’t so much a scheduler as it is a tool for goal setting. What is your favorite organizer for your time, tasks, and goals? Leave a comment and I’ll draw a name next Saturday, January 30, at 9 p.m. CST. 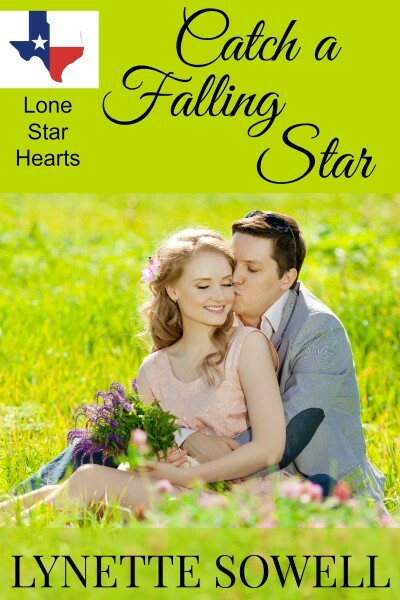 The winner will get an e-copy of Catch A Falling Star, book one of my re-released series Lone Star Hearts. It’s set in the fictional town of Starlight Texas, very close to where I live near Fort Hood. Justine Campbell would gladly rewind her life a year or so back before it crumbled around her like so much gilded plaster. Billy Tucker could use a rewind button, too. He’d go back to the day before his humvee exploded in Iraq, injuring himself and killing two of his buddies. Billy’s bitterness and Justine’s humiliation make for a prickly pair when they first meet, but can either of them let go of the past long enough to let God make their paths straight again? Welcome to Starlight, Texas, a small town with plenty of Texas twang and a kaleidoscope of cultures from around the world, thanks to nearby Fort Hood. The older I get, I have to write everything down. This might sound strange, Lynette, but I get excited at the end of the year when it’s time to shop for a new calendar. Typically, I buy the Daytimer, but I’ve been tempted by the Passion Planner. Electronic devices don’t appeal to me because I enjoy checking off the tasks I’ve accomplished. With all of the ice we had in Charlotte yesterday, the green on your book cover makes me long for spring. It’s a beautiful cover. I love new walk calendars! Not sure why but we have a least four up in the house. I am not an organizer. I use my phone for my kids’ appointments and things like that, but usually I don’t have a planner or any kind of organizer. I like the pretty embossed covers of the Paperblank dayplanners. Mine has a page for every day, then Saturday/Sunday share a page. I get shaky if I don’t have one for the year, but then, honestly, I don’t use it to advantage. At this point, my life is pretty quiet, so a planner is overkill for me, even though I’m tempted to buy one each time I see a new one. =) My husband and I do have a white board/cork board where we write down things coming up. That helps keep us on the same page which is definitely helpful! I have to try to plan, knowing it’s all in God’s hands and subject to change without notice, or the days just disappear! And it’s so easy for me to forget! I’ve worked out my own system, a mix of annual, monthly, and weekly goal setting sessions, all done electronically, but accessible on my laptop, phone, and Kindle. Then I journal every day, and my journal page has a specific space to set the goals for the day. EVERYTHING goes in there, even mundane everyday stuff, and stuff I really need to remember goes into my Google Calendar. I badly need those reminders that pop up! Then as I do things, they get crossed off. Seeing what I’ve done feels good! At the end of the day, I assess again how I did in all the most important areas of my life (God, marriage, other relationships, home, writing, self-care) and what needs to be carried over to the next day. It sounds crazy complicated, but it works for me! Love that book cover, Lynette! my big calendar and whiteboard is my organizers! I have a desk size calendar for all my household appointments, then a separate thin book style one from the dollar store where I write all my writing commitments. As far as goals go, they are all writing deadlines :) so they are in my calendar. Daily tasks sometimes get put on a list, but I generally don’t bother with a list. Since I just got my first iphone and I am electronically challenged, making lists/writing things down is what works best for me! I use a combination of wall calendars, small day planner, and a purse sized calendar to try to keep organized. My family and I lived near Ft. Hood, in Copperas Cove, for three and a half years, so your book is very appealing to me. Though I’m happy to be back in my native Kansas where my extended family lives, there are times I miss the Texas hill country. I use a combination of tools to keep me on track: a desk calendar and iPhone for appointments and events to attend; a white board with my overall goals for the month and year; and a journal. I keep the journal open on my desk, where I list each day’s goals and accomplishments. Being able to put a check mark next to a “To-Do” task really gives me a feeling of accomplishment. I am a list maker (as in pen and paper)…..grocery, to-do, household chores I want to accomplish for the day, etc. I also write all appointments on my calendar & I have a white dry-erase board on the front door that I write down what’s happening for the week. I find it very satisfactory to cross off each thing accomplished. I’ve never had a use for a planner or the one that comes on my phone, don’t know why, but they just don’t work for me. I guess since I’ve been doing it the old fashioned way for so long, I stick with what works for me! I do know a gal at church that has 2-3 planners & each one is filled to the brim…I have no idea how she gets everything done, lol! !